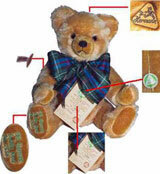 MUSICAL Limited Edition Teddy Bear. Classic Music Series. In dedication of the 250th birthday of Johann Sebastian Bach. With extraordinary creativity, Johann Sebastian Bach (1685-1750) wrote many works with different genre. His art is an expression of the occidental mind. Among his elders, Bach was especially famous for his virtuoso organ playing. Educated as an organist, he dedicated most of his time to church music. Works like "The Passion" and "Chorale", were developed after he took the position as a cantor at the Thomas church in Leipzig. Before this time he was a conductor in Weimer and Koethen where he developed a different style of music. Without his musical church duties he dedicated most of his time to entertaining with Baroque music. German Mohair Bear, HERMANN-Spielwaren GmbH 192532. This delightful, Musical Teddy Bear is fully jointed, handcrafted of fine Mohair and filled with traditional excelsior stuffing. With a Musical voice that plays Minuet No.3. He is 15.75 inches tall. European Edition. Limited Edition of 500.